Advanced machine-vision techniques of the IMTEX system enable better quality fabrics to be produced. Straightening the weft of textile web is an important stage in the finishing of fabrics before they are used for the manufacture of clothing and other items. Currently this process involves boring, repetitive and tiring manual inspection. The rapid reduction in the price of both computer systems and digital cameras, combined with advances in image-processing techniques, means that low-cost machine-vision systems are now an affordable reality in many areas of manufacturing. These developments mean that cost-effective on-line systems for the control of bow and skew in woven and knitted fabrics are now possible. Such systems are highly modular and can be integrated into existing production lines. This short article describes an innovative, automatic measuring and control system for fabric production based on advanced image-processing techniques. humans are now relieved of boring, repetitive and tiring tasks. A system costs between 25 and 50 K Euro and pays for itself within two years of operation. Across the world, the consumer demands better and better quality in manufactured textiles. This is especially true for textile finishing where raw textiles, which cannot be used in their original form, are refined through physical and chemical processes. The finished fabric is produced with properties appropriate to its intended use such as clothing, home textiles, industrial fabrics and so on. The straightening of woven and knitted fabrics is a necessary part of the drying and fixing processes in the finishing phase of manufacture. Fabrics, generally 0.6 to 4 metres wide, pass through the finishing line at rates of between 20 to 100 metres per minute. Straightening is a complex process requiring the control of a machine up to 50 metres in length. Incorrect adjustments can cause significant material wastage. Automatic weft straightening devices have already been successfully implemented for homogeneous textile materials. Until recently, all distortion measurements on material with complex patterns were performed manually by experienced staff. Current weft straightening devices evaluate the thread structure over small measurement areas using a variety of optical devices. This enables straightening along the thread and mesh lines during stretching, drying, fixing, and printing of the material. However, as the amount of patterning increases, the results become more variable. With very heavy patterning, the distortion information is completely lost. 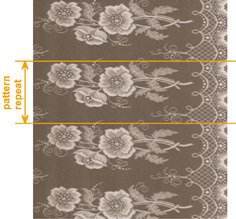 The quality of distortion measurements is influenced by numerous parameters, which depend on the design of the fabric. Current weft straightening devices cannot analyse the fabric design, so that automatic adaptation to the fabric is not possible. In addition to distortion, the repetition characteristics of a pattern is an important property which must be monitored. Conventional weft straightening devices cannot measure this characteristic. Many of the disadvantages of conventional systems can be overcome using image-processing techniques to monitor the entire width of the textile material. The basis for straightening depends both on the orientation of thread and mesh structures and on complex design patterns with large discontinuous areas. Adaptive selection and parameterisation of the characteristics of a fabric can be made after an analysis of its design. A new system, which can resolve the thread structure of textiles, has been developed. It can scan the entire width of the fabric to ensure a complete evaluation of patterns and thread layers. This system can control the straightening machine in real-time. It overcomes the limitations of existing sensors and can extend the automatic measurement of distortion to complex patterned designs. Distortion measurement is now possible by evaluating the relative position of weft threads or stitch rows and by determining pattern positions. In pattern-oriented distortion measurement, the pattern repeat distance can be simultaneously measured. 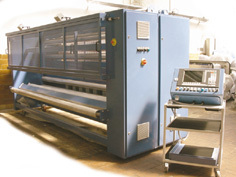 This system improves the quality of fabric from the straightening process. The operator is released from a difficult and boring supervision task. Through the use of advanced image-processing algorithms, automatic adaptation to changing designs is now possible. Commensurate with customer requirements, a complete straightening machine has not being developed, rather a scalable distortion measurement module that can be integrated into existing straightening machines. The new system is a compact arrangement of several horizontally cascaded line-scan cameras with suitable illumination, a multiprocessor system for image processing and additional computing modules for process control and the user interface. Zentrum fuer Bild- und Signalverarbeitung e.V.